The return of the Golden Age Flash. A year after its successful “Rebirth” launch, DC has teased the return of the Justice Society of America. In the just completed story arc “The Button,” a four-part crossover in issues of “Batman” and “The Flash,” two members of the legendary super-team missing for years make appearances. “The Flash” No. 21 opens with Johnny Thunder on the edge of a rooftop, screaming into a driving rain for his thunderbolt. Orderlies grab the feisty 90-year-old and drag him back down. “We lost the Justice Society! It’s all my fault!” he cries. Doubtful. But I feel your pain, Johnny. Angry man shakes fists at the sky: Johnny misses the JSA, too. Here’s what’s exciting: A member of the Justice Society exists in the DCU and he remembers the team. That, my friends, is freaking huge. But that’s all we get of Johnny Thunder, who probably is heavily medicated. For the moment. In “The Flash” No. 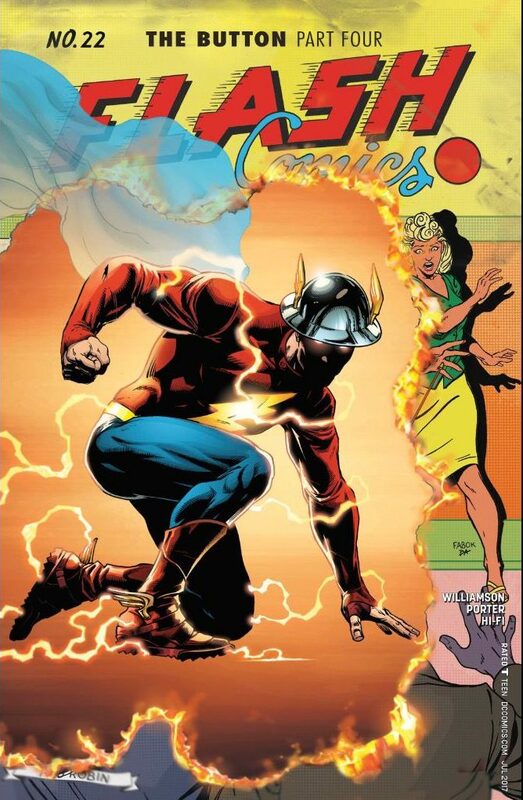 22, the concluding chapter by Joshua Williamson and Howard Porter, the Flash and Batman are lost and trapped in the time stream. The cosmic treadmill is in bits. At their darkest moment, a voice calls out to Barry, begging him to say his name. “We have no idea where it’s going to take us,” Flash protests. Welcome back, Jay: The DCU has not been the same without you. And with that, the Golden Age Flash, the Crimson Comet, the first and the brightest speedster breaks through the dimensions. This panel. (Click on the thumbnail – or any others – for a better view). Oh. It gave me such a rush and joy. I need this as a poster. A pillowcase. Hell, give me a tattoo on my bum. 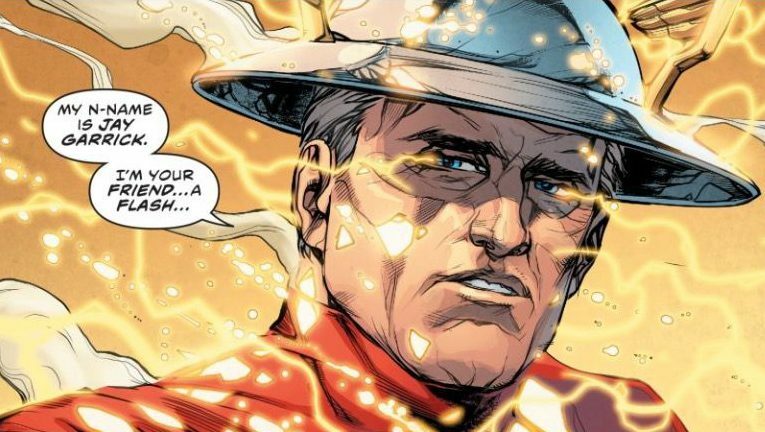 It’s really, truly Jay Garrick. How I have missed you, Jay. 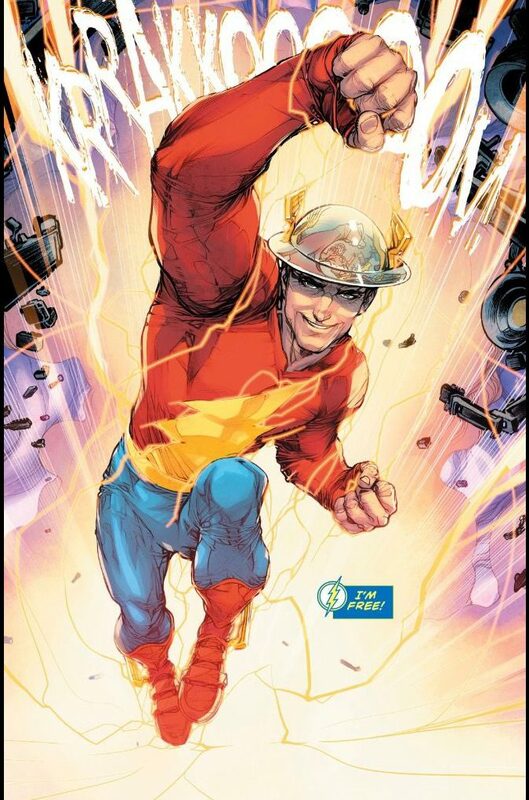 Jay Garrick: Cosmic Uber driver in the time stream. 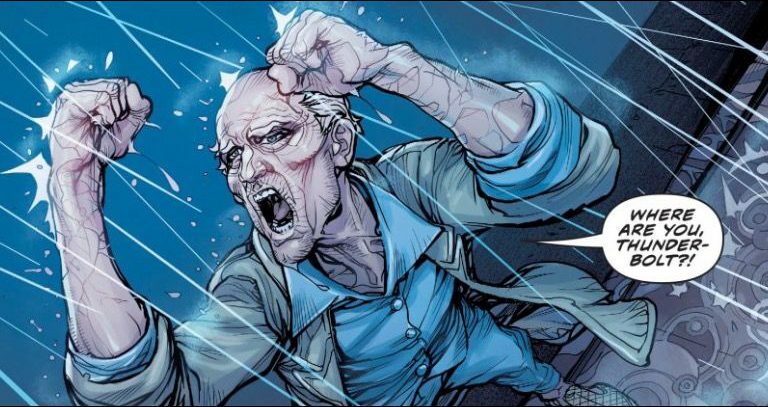 Jay grabs Batman and Barry and powers them back to their proper time and universe. Barry doesn’t remember his old friend and mentor. There have been a lot of clues as to what’s been going on and why nobody remembers the Justice Society. Best guess: The Watchmen’s Dr. Manhattan plucked much of the team out of the universe to weaken the heroes. Without the Justice Society serving as mentors and inspirations to so many of the heroes, including most of the Justice League, the Rebirth DCU is weakened. The story will pick up this fall in “Doomsday Clock,” a miniseries starring Superman that promises to reveal Manhattan’s dark machinations. Here’s a thought: What if the DC Universe Rebirth we think we’ve been watching for the last year hasn’t happened yet? What if this has all been a prelude to the DCU being restored to its pre-Crisis glory? In a huge break from publishing norms, to take an event story and cross it over with every damn title in the line (I’m looking at you, Nazi-loving Marvel), “Doomsday Clock” will have no crossovers, no tie-ins, Johns told “The Hollywood Reporter” earlier this month. It’s a stand-alone mini-series. This sounds like a true event. And given that it is being written by the guy who got his start and made his reputation on the great “JSA” title and was responsible for the team’s longest, most successful run, we should all be encouraged. Fastest friend alive: See you soon, Jay. Am I in? Damn right! I don’t read The Flash so thanks for the heads up as I will definitely be looking forward to a JSA return. I wonder how (if at all) it will tie in/interact with the latest Earth 2: Society stories – that series wasn’t bad and it would be a shame to throw those characters away completely. Gary, that four-parter is definitely worth picking up. Interesting to think about ‘Earth 2: Society.’ There’s no way DC wants to leave Power Girl or Huntress in limbo too long, not with the legion of fans out there. We shall have to see where the upcoming miniseries “Doomsday Clock” takes us.